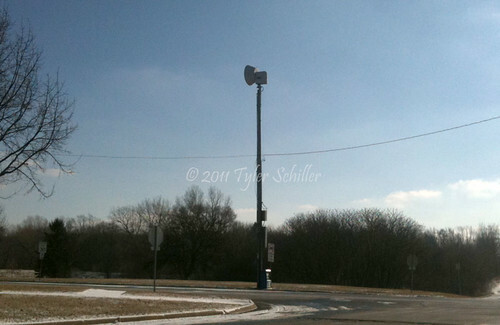 The Brookfield, Wisconsin Common Council has ageed to cut off funding for all the tornado warning sirens in the city of Brookfield, Wisconsin starting in 2013. It appears the sirens will need to be upgraded to code which will cost Brookfield taxpayers too much money. At the bottom of the WISN article (linked above), many people from Facebook made comments about the Brookfield council's decision to cut off the sirens after 2012. Some were upset by the decision and I understand their frustration, but there is another option to ease everyone's fear if the tornado sirens are no longer available. The Brookfield fire chief mentioned with the internet and smartphone technology available today, warnings are more accessible through these avenues. This is true. I own a iMap Weather Radio App on my smartphone and it alerts me of any severe weather in my area. The problem is, do most of the population use smartphones, such as the elderly and someone who isn't technology inclined? Probably not. Their argument is valid for the need for tornado warning sirens. I had a fellow Wisconsin storm chaser comment on the article asking if this decision made by the Brookfield government officials was indeed a joke. At first I asked myself the same question, but in my opinion the NOAA Weather Radio hasn't failed me once. Tornado sirens have failed in Wisconsin during many tornado events in the past. I explained, "I felt NOAA Weather Radios are superior to the tornado warning siren. Most people commenting on this article don't even know these devices exist." I could be wrong, but that's the take I got from reading everyone's responses. Does the public know about these devices? "Do you take yours (NOAA Weather Radio) outside??? Take it swimming or jogging with you?" Does this person know they sell portable weather radios? Probably not. I found this troubling after many years of promotion from the National Weather Service. The meteorological community still needs to push the public to buy a weather radio or at least inform them that they are available. I use my smartphone for weather alerts if I'm out jogging, swimming or outside doing whatever. Simply, I could just check the weather forecast before heading out. "How will people be notified of dangerous weather if the power goes out during a storm. If you have no power, you have no tv or internet. Also there still are a lot of people that don't have cell phones." NOAA Weather Radio has a battery back-up; there's your answer. "That is the dumbest thing I ever heard. Not everyone has cell phones, tvs and internet and even if everyone did what about when you are sleeping at night and a tornado rolls through????? I don't check my texts when I'm sleeping! But I do hear the tornado siren." Once again, a NOAA Weather Radio would be the answer. It would awake you at night. Also, tornado warning sirens are meant for people outside only, NOT when you are inside your home or a commercial building. "Do I really want to carry my cell phone when I am out running? Swimming?" Who doesn't carry their cell phone with them at all times these days? This person does brings up a good point though. I went storm chasing on July 22, 2010 in Fort Atkinson as a tornado warned storm approached our position. My chase partner and I pulled over on a road to watch the storm and a gentleman past us jogging. He was startled and unaware that a Tornado Watch had been issued 4 hours prior. In this case, I would probably advise citizens to check the weather forecast before you head out for a jog or swim. "An ounce of prevention. Easy for the powers that be to risk so many lives. Maybe they need to be reminded of the horrendous tragedies tornadoes cause." Tornadoes do cause tragedy, but they aren't much of a concern in Brookfield, Wisconsin as they are in Kansas, Missouri or Alabama. Tornado sirens do cost taxpayers quite a bit of money and if they aren't used that much, I can see why the council cut the funding for them. Again, this doesn't mean I necessarily agree 100% with their decision. According to the Tornado History Project, since 1950, 29 tornadoes have occurred in Waukesha County, Wisconsin. Two of twisters in the county struck Brookfield. In 1977, a F2 twister tore a path between Capital Drive and North Avenue. In 1982, an F1 twister occurred behind Kohl's Department Store in Waukesha|Brookfield city limits. No one has ever been killed. "Give him a competency test! How many elderly carry a cell phone all day, or listen to the radio in Brookfield?" You don't have to listen to the NOAA Weather Radio. It goes off to alert you when severe weather is occurring in your area. "Sure all the rich people that live in Brookfield can't afford to upgrade a system that could save lives someday. I can't afford a fancy cellphone and my work truck does not have a radio. I hope the people who made this idiotic decision are in the cross-hairs when a tornado hits. All it takes is one...."
Once again, owning a portable NOAA Weather Radio solves this problem. To illustrate the comments above, it appears people depend on sirens to warm them. Unfortunately, tornado sirens are not bullet proof. The Siren, Wisconsin EF3 Tornado that killed 3 people, back in 2001. The sirens failed to sound due to a lightning strike. The Eagle, Wisconsin EF2 Tornado in 2010, injured over 20 people. During the tornado, the siren in Eagle failed to sound. Last April's Wisconsin Tornado Outbreak, the the sirens failed in Outagamie and Winnebago Counties. The NOAA Weather Radio warns us of a developing tornado west of our location near Bowdle, South Dakota. Out in the plains, sirens are few and far between. A NOAA Weather Radio is crucial to receive warnings. I'm neutral on the council's decision, but my point here is to help people to stop being dependent on the tornado warning siren. A NOAA Weather Radio is a better option in my opinion. If you're out running or swimming, and don't have access to a weather radio or smartphone, check the weather forecast before you leave and become aware. Moving forward, the residents of Brookfield might find this decisions inconvenient, but I hope they are made aware the NOAA Weather Radio is available and it can help save lives. This idea sounds great until a F5 is seen on TV approaching a large city and we hear dead silence as the debris is flying around. Then wait for the media to interview a survivor with those famous words: "We never knew it was coming"
Thanks for posting James! Hopefully that event you described won't happen around here. I am a Brkfld resident. Have been for over 30 years, my wife, over 50 years. I was IN BROOKFIELD in 1977 when the tornado which hit just east of Elmbrook Hospital caused about 4.5 million 1977 dollars. There was so much damage, the Brkfld PD was inundated with the need to secure property, it resulted in the Brkfld. PD Auxilliary being formed. When this was done, I volunteered. Maybe the tornado wasn't quite close enough to Brkfld. City Hall, that anyone on the Council, or the Mayor remember this. Maybe they should spend some time viewing the catastrophic damage done last week from those numerous violent tornadoes, and poll those residents if their communities sirens helped them become aware of their changing weather conditions, or if they had cell phone "alerts." As far as the $$ cost to Brookfield, with about 34,000 residents, that would be about a $3.00 increase in my taxes. TAX ME! Oh by the way, the cities population grows to over 100,000 during a working week day. I doubt all of THOSE people would be hooked up. PLEASE KEEP OUR SIRENS !!!!! Brookfield has come to their senses and kept the sirens. Sirens are not a "cold war relic" as referred to by the fire chief. In a tornado emergency you need ALL MEANS NECESSARY to warn a city population. I believe the 1977 tornado that caused 4.5 million as you described Tom was on June 5, 1977. According to records it was a long-tracked F3 tornado - http://www.tornadohistoryproject.com/custom/1108031 and it had come close to the city limits. Thanks for sharing your experiences. If Brookfield residents want the sirens, the council should upgrade them and it looks like they will. I hope residents will still consider buying a NOAA Weather Radio. This may also be the Apr 2, 1977 event. This F3 caused extensive damage in Brookfield and Wauwatosa. Or it may have been the April 2, 1977 event. I remember meteorologist Paul Joseph talked about how extensive the damage was when I met with him at WTMJ4 when I was a kid. One website says it was an F2 and another site says it was an F3 tornado. NOAA Weather Radio or Tornado Warning Siren?